EnergoRea Division provides services in design, engineering, delivery and assembly, focusing on power facilities, measurement and control systems, particularly for hydropower industry, heating technology, combined heat and power generation, management of water treatment and wastewater treatment plants, not only in the Czech Republic, but also in many countries around the world. In 1998, EnergoRea Division has extended its activities to its own production of low voltage switchboards. The Division delivers technological equipment, including automated dispatch control system, power and technological subway equipment, and software for the Prague subway. INGOS Ltd. also provides warranty and post-warranty service for all the equipment and devices delivered. We can take complete care of building services equipment, power and heat management, water supply and water management constructions, manufacturing and non-manufacturing technology and environment friendly constructions. 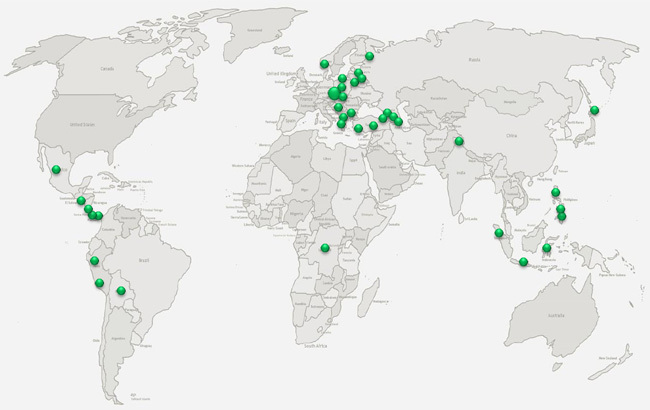 Click on the link in the table or the green dot on the map to see hydroelectric references in the given country. You can find references from other areas of EnergoRea here. 1997 Energo and Rea Divisions established, projects for Prague Transport Company, Central wastewater treatment plant in Prague, Pilsen, etc.